Our condolence gift packages are the perfect way to express your caring and heartfelt sympathy. 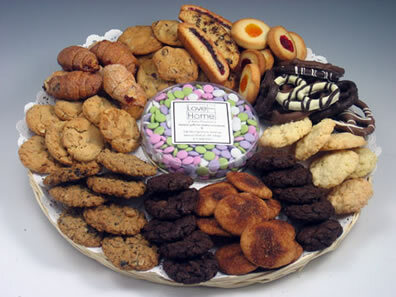 Our most popular cookie trays are arranged with a full selection of our “homemade” cookies and can include schnecken, kmish broit, chocolate pretzels . It will arrive beautifully wrapped and ready to serve. 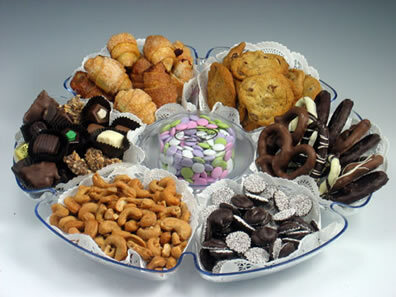 This lucite divided tray can be filled with a variety of our LoveFromHome selections. Everyone loves chocolate pretzels!! 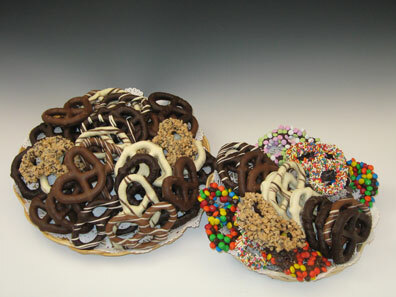 We have a wide variety of chocolate pretzels that are a great welcome for any occasion. Our trays can be filled with traditional milk,dark or white chocolate or a variety of our gourmet topped pretzels. Whatever combination you choose they are always a hit ! covered pretzels. 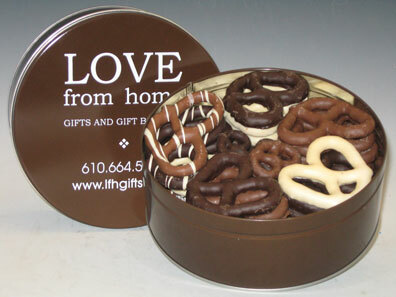 2lbs of assorted chocolate pretzels in a flavor keeping tin! A favorite of everyone. 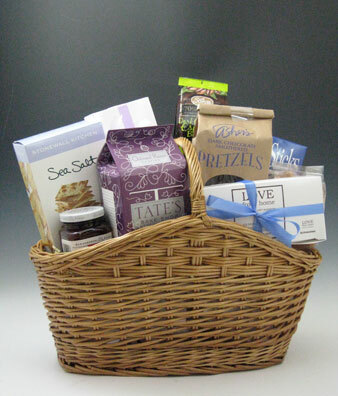 This basket is filled with preserves, crackers, cookies, nuts, chocolate pretzels, cheese sticks, chocolate espresso beans and more. 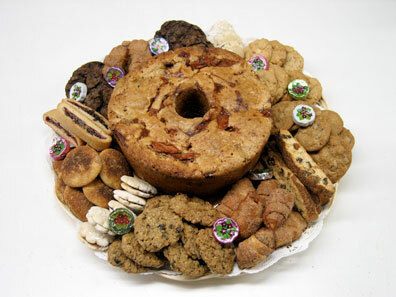 Any combination from our sweet and savory selections creates a wonderful thoughtful package. 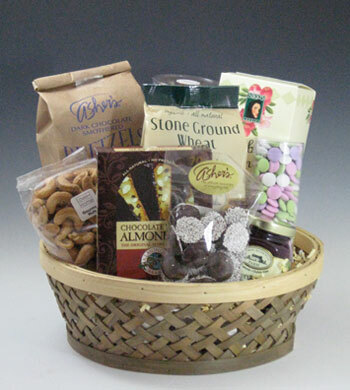 A basket filled with a assortment of sweets and homemade cookies can be created to show a expression of sympathy; all you need is your personal note and we will deliver your gift beautifully gift wrapped. 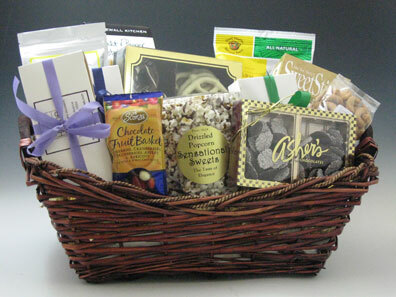 We always have a fine selection of Kosher and Parve sweets to add to Shiva gift baskets. 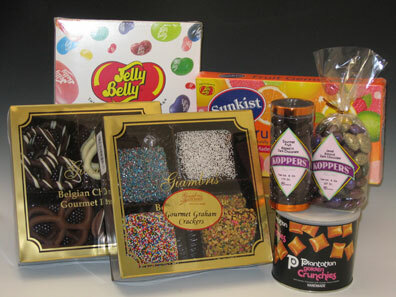 Asher’s, Giambri, Jelly Belly, Koppers and Sensational Sweets are available in many varieties and flavors. 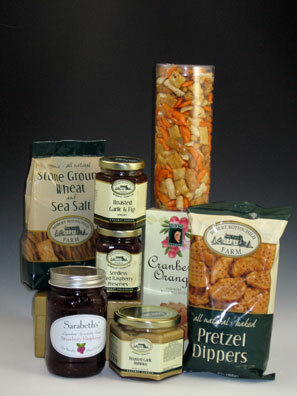 Crackers, jam, preserves, spreads, cookies and snack mixes, nuts and more can be combined with our many Kosher products to make a tasty, gourmet gift basket. Our cakes stand out on their own too. We have Jewish Apple, Luscious Lemon and a dense rich Chocolate cake. We can also send your cake on a pretty cake stand . 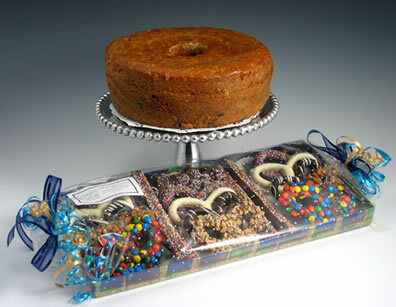 Cakes….$36.00 Cake stand or plates are additional. * Our inventory is always changing to make room for new and unique products and seasonal changes. Substitution may be made but we never compromise quality. All substitutions will be of equal or greater value.